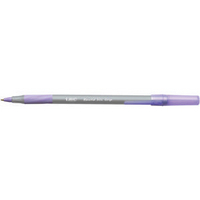 Bic Purple Stic Grip Class Pack Pk 40 Vibrant purple ink. Comfortable rubber grip. Slim barrel with cap and clip. Medium 1. 0mm nib writes a 0. 4mm line width. For the full range of Bic ball point pens go to pages 79-83. Approx Dimensions (CM): D15.3 W7.3 H7.2. Approx Weight (KG):0.22.